The first in a series of classic texts from Frances Lincoln reimagined in the modern day. Robert Hunter is a London-based illustrator working with traditional drawing and painting techniques. This is his first children’s book. via Bill Murray to Play Baloo in Disney’s New ‘Jungle Book’ | Rolling Stone. Complete and unabridged text including the often-omitted thirteenth story The Tabu Tale, with fabulous illustrations by Robert Ingpen who has now worked on eleven classics for Templar. Ingpen, now in his 77th year and working as impressively as ever includes an Illustrator’s Note at the back of the book. 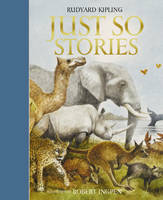 And if you haven’t read the Just So Stories for a while, or are coming to them for the first time, you will be delighted to discover how fresh and verbally inventive these stories of Kipling’s, first published in 1902, remain.